For over a year, I was a part-time Torontonian. I dated a foreigner and spent weekends at classical concerts, the beach, and eating vegan burritos in downtown T-dot. Danila Botha’s Too Much on the Inside definitely swerved a few corners from where I was spending my time. An earthy portrait of love, loss, and confronting the past set in Toronto’s Queen St W, Botha’s first novel is incredibly moving, gritty, and authentic. Too Much on the Inside is an honest and moving love letter to Toronto’s hodgepodge cultural fabric exploring bar life, cross-continental connections, and heartbreak. It has the paradoxical distinction of being radically different from my own experiences yet totally relatable: much like meeting a stranger from abroad in the hub of Toronto who has much more in common with you than at first glance. Too Much on the Inside is an exploration of four fascinatingly dissimilar characters whose lives intersect and influence each other irrevocably. The novel reminds me of the fugal interlacing of P.T. Anderson’s Magnolia and the down-to-earth sincerity of J.K. Rowling’s A Casual Vacancy. Dez is a Brazilian Don Juan interested in Canada’s heterogeneous culinary and sexual cuisine. He runs a bar where Nicki and Marlize wait tables. Nicki grew up in Israel, where she spent time in the military. She’s dating Lukas, a transplanted hospital janitor with a crime-laced past who grew up near a military base in Nova Scotia. Marlize is an ex-ballerina from South Africa studying at Ryerson who is escaping a violent past. They are dealing with their ambivalent relationships to Toronto as well to each other and themselves. Too Much on the Inside is an incredible feat of literary structural engineering: we collide with these four people knowing very little about them. Slowly, like groggy survivors of a car crash, they divulge haunting memories and experiences from their time in Canada and beyond. We discover their darkest fears and secrets. Each person’s personalities and motivations become clearer and we feel disgust, admiration, empathy, and pride towards them. Eschewing the traditional blocky chapter form, Botha moves deftly between the characters in effortless stream-of-consciousness, first-person writing. It has the disconcerting effect of being a collective voice of the bustling, multi-hued metropolis that is Toronto as well as a TV show that flips channels between parallel lives. It is a lot like being pushed onto a busy street in downtown Toronto: at first discombobulating, hearing chatter in countless accents and languages, and then enticing as the voices begin to emerge as captivatingly diverse faces and people. Botha’s writing is masterful – deceptively simple, with an astonishing attention to detail that creates a multi-coloured fabric of distinct locales and personalities. Personally, I put off reading the final pages of Too Much for a of couple weeks and even so, at its close, I felt that Too Much on the Inside definitely did not have enough pages on its inside. It’s not every day that an author has the ability to create such indelibly memorable and strikingly flesh-and-blood characters. Botha’s characterization is so powerful that I wish that I could call up Leo, Nili, Marli, and Lukas to ask them how things have been going post-book. These are conflicted, complex, and flawed people who are difficult to leave behind at the end of the novel. Their heartbreak, loss, and ultimate emotional awakening are true to life and undeniably human. Their mistakes are inevitable but still difficult to accept when they occur and their moments of bliss and realization are bittersweet but stirring. Despite the beautiful memories I created in Toronto, it was also a similar maze of conflicted feelings, emotional roller coasters, and eye-opening discovery that culminated in understanding through the anguish. 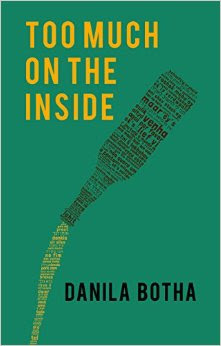 Botha’s Too Much on the Inside is a reminder that most of us are simply trying to come to terms with love, loss, and identity crisis no matter where we come from, what our past was, or who we are striving to be in the present. Fortunately, like the four resilient protagonists in Too Much on the Inside, we’ve got each other in this journey, no matter how disparate or exotic we might seem to be on the outside. Mike Fan is a Chinese-Canadian classical baritone. Mike plays five instruments and speaks three languages (with a few in progress). He holds degrees in piano performance and biomedical science, but it was apparent from an early age that music would win out. On the literary side, Mike wrote 365 sonnets in his teens and writes for his poetry blog Some Turbid Night. Follow @MikeZFan for Mike's adventures, musical and otherwise.